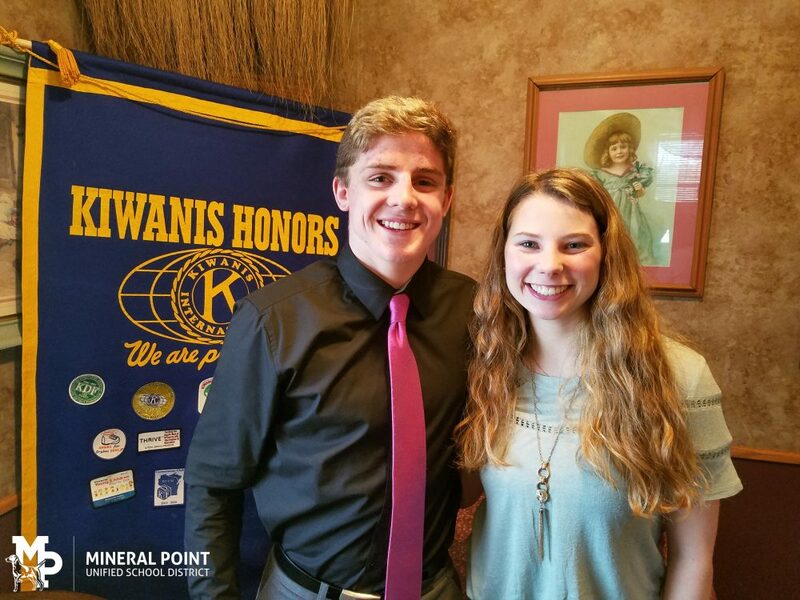 The Mineral Point Kiwanis Club honored its March Students of the Month at its meeting Tuesday, March 19 at the Pointer Cafe. Riese Federman has lived her whole life with her parents, John and Tricia, and her sister Jerra in Mineral Point. She would like to thank the Kiwanis Club and her teachers for giving her the honor of being Student of the Month. Riese would also like to congratulate her Co-Student of the Month Danny Pittz. During the school year, Riese is involved in many extracurricular activities. These involve Mock Trial, Key Club, Book Club, National Honor Society, a Blue Crew member, and a varsity soccer player. These clubs have given Riese opportunities to meet new people and learn new skills. Of all the activities Riese takes part in, Key Club has had the biggest impact on her. Riese has been a member of the Key Club for all four years of high school. Key Club has taught Riese that even the smallest contributions to her community make a big difference. Soccer has also had a big impact on Riese’s life. Riese has been playing soccer since she was five years old. Soccer has taught Riese leadership, the value of hard work, time management, and the meaning of teamwork and friendship. She cannot believe it is her last year of playing, but she knows this year is going to be filled with great opportunities for not only her, but her teammates as well. Outside of school, Riese works at Lands’ End in the mornings before school. This was a challenge for her at first, but it is now just part of her routine. In high school, Riese has enjoyed taking many science, math, history, English, and Spanish classes. Although these classes challenge her, she tries her hardest to understand all the material. Next year Riese will be attending The University of Wisconsin-Platteville to major in biology. She would like to thank her parents and sister for always supporting her and pushing her to be the best version of herself. Danny is the youngest child in a family of seven which includes his mom, Teresa, dad, Troy, two older sisters, an older brother and an older cousin who lives with his family. He is currently a senior at Mineral Point High School who is involved in many extra-curricular activities which include being a three-sport athlete in the sports of wrestling, golf, and football, President of the FFA, National Honor Society, National Junior Swine Association, Skills USA, Youth Group, and Blue Crew Member. He plans to attend Southwest Tech to pursue a degree in electrical power distribution and hopefully get a job as a lineman upon his college graduation in the spring of 2020. His ultimate goal is to be employed by Alliant Energy in Mineral Point where he would like to settle down and start a family. Danny enjoys being outside and spending time with livestock, which is why he enjoys his job as a farmhand at May Cattle Company and raising his show pigs each summer, which are exhibited at county and state fair. In addition to raising show pigs and working at May Cattle Company, Danny enjoys spending time with his family and friends doing activities such as jet-skiing, campfires, golf-outings, and working on his grandmother’s farm. Danny has been lucky to have many teachers and individuals that have impacted him greatly, but one, in particular, is his wrestling/golf coach and gym teacher, Mr. Scott Schmitz. Mr. Schmitz has left a lasting impact on Danny due to the life lessons he has taught him in and out of the classroom and sports scene. Mr. Schmitz has taught him to be a more responsible, hard-working, and polite individual. Their relationship extends beyond school-sponsored events, as they do activities together such as trips to Cabela’s, attending college wrestling matches, golf-outings, and hanging tree stands at their hunting cabin. Danny would like to thank the Kiwanis members and congratulate Riese on being selected as a Student of the Month.